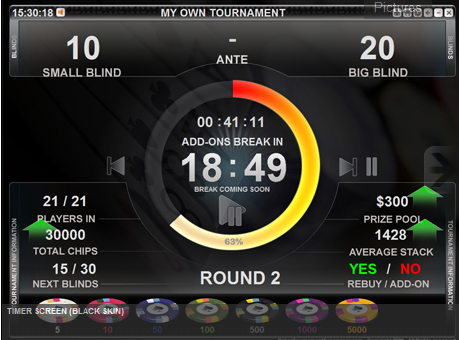 A variety of poker tournament clocks are available, but one of the easiest to use is Poker Tournament Supervisor. This French-designed clock is relatively new and can handle single- and multi-table tournaments, whether in your home or in a brick and mortar casino. How many players are left in our home game? What will my $10 buy-in turn into if I cash for third place? Are rebuys allowed in this casino's tournament? What about add-ons? How much is this purple chip worth? All of these questions and more can be answered using the Poker Tournament Supervisor, known as PTS for short. This user-friendly program is a relatively new addition to the tournament clock world. In just a few minutes, you can input the requisite information for your sit and go tournament or large-scale multi-table event. The main display alerts players involved in a tournament as to its total prize pool, pay scale, number of chips in play, number of players remaining, the average stack, current blinds, upcoming blinds, and the amount of time to go in the current level. A full display of the number of chips in play, complete with the colors for each, will allow players to understand exactly where they stand relative to the rest of the field. A computer-based program, PTS requires one of the following operating systems in order to function properly: WinME, Windows 2000, Windows XP, Windows Vista Starter, Windows Vista Home Basic, Windows Vista Home Premium, Windows Vista Business, Windows Vista Enterprise, or Windows Vista Ultimate. Chances are that any new computer has one of these, making for an easy download and purchase in order to run a successful home game. PTS runs right on your computer, so you'll need to be able to see it from the table. Alternately, you can attach a monitor. It does not require the internet to use, as it is a fully-downloadable program. In comparison to more expensive alternatives, PTS is rather affordable. Recent additions to Poker Tournament Supervisor include digitized voice notification for the beginning of rounds, blind and ante levels, table reorganization, and the ability to insert breaks. The software can also automatically seat players in just a few seconds. Check out Poker Tournament Supervisor today.